Today I found out about the origins of the names of the Australian states and territories (and their capitals). As you can probably imagine, this territory houses the capital of Australia, Canberra. Not very imaginatively named, the territory was a matter of debate for some time after Australia became a federation in 1901. At the time, Melbourne, Victoria was the largest city, while New South Wales was the largest colony. They decided to carve out a space for the capital between Melbourne and Sydney. New South Wales officially ceded land to the creation of the territory, which was initially known as the Federal Capital Territory, on January 1, 1911. Most “New” names aren’t hugely interesting, but you have to wonder how Captain James Cook came up with this one. The hot, muggy climate of Australia isn’t exactly the same as the more temperate Wales. Unfortunately, Cook never explained the name in his journal, and it’s thought something about this state must have just reminded him of the coast of Wales. Up for debate is whether he meant it was similar to South Wales, or if he was reminded of Wales as a whole and named the area New South Wales because it was in the Southern Hemisphere. Australia’s current largest city is named after Lord Sydney, the Secretary of State for the Home Office. Lord Sydney was the man in charge of deciding where to send the convicts from England and he decided upon Botany Bay. When the First Fleet arrived in 1788, they discovered that Botany Bay wasn’t suitable, so they explored a bit further up and found fresh water and a cove which was later named Sydney Cove after the lord. The city that was eventually built up around the cove was called Sydney by association with the cove. This territory is named because, you guessed it, it’s in the north of Australia. Interestingly, there are parts of Queensland that are slightly more northern than the tip of the Northern Territory. It was made a territory after its split from South Australia in 1911. Other names proposed included Kingsland, after King George V, and Territoria, but they didn’t stick. Port Darwin was discovered in 1839 by Captain J.C. Wickham, who named it after Charles Darwin. However, the town that grew up near the harbour was originally called Palmerston. After a time, most residents simply called the town Darwin, after the harbour. In 1911, the name was officially changed. Starting in the 1850s, the people living in Queensland—then part of the New South Wales colony—started petitioning for independence. The seat of the colony, Sydney, was too far away, and future Queenslanders wanted to govern themselves. They petitioned to separate, and in 1859 Queen Victoria granted them their own colony. They named it Queensland to honour her, as the colony of Victoria had already been established. Queensland’s capital is named after Sir Thomas Brisbane. The city started being settled in 1824, when the penal colony at Redcliffe was established. Free individuals started arriving in the 1840s. Originally, the name was Edenglassie (a combination of Edinburgh and Glasgow), but residents started to favour the name Brisbane after Sir Brisbane, who happened to be the governor of New South Wales at the time. (The name is not pronounced “bris-bane” like it appears; rather, it’s pronounced like “bris-bin”). You’ll notice that South Australia is missing the –ern­ ending that the other directional state and territory have, but this isn’t thought to have any significance. “South Australia” simply sounded better than “Southern Australia.” The state isn’t the southernmost state. That distinction belongs to Tasmania, and even Victoria has areas that are more southern than South Australia. This capital city is named after Adelaide of Saxe-Meiningen, who was the wife of King William IV. Her full name is actually Amalie Adelheid Louise Therese Karolina Wilhelmina, but that would have been a bit of a mouthful for a city. Though King William was still reigning at the time the city was named (1836), he was considered to be a “buffoon” and people preferred his wife, who had helped people gain the vote in England, helped to abolish slavery, and stood up for the rights of children. The island state was discovered in 1642 by Dutch explorer Abel Janszoon Tasman. He named it Van Diemen’s Land after his superior Anthony Van Diemen. It was made a British convict colony in 1803. The name “Tasmania,” after the man who had discovered it, was slowly put to use instead. A map with both Van Diemen’s Land and Tasmania was circulated in 1808, and in 1823 a book called Godwin’s Emigrant’s Guide to Van Diemen’s Land, More Properly Called Tasmania was published. After convict transportation was ended, people advocated for a name change to get rid of the convict association with Van Diemen’s Land. In 1855, Queen Victoria signed an agreement to change the name, and on January 1, 1856, the island became known officially as Tasmania. Hobart was named in honour of Robert Hobart, Earl of Buckinghamshire. He was the Secretary of State for the colonies at the time. Originally, it was called “Hobart Town” but the “town” was dropped when the capital officially became a city in 1881. Afterwards, there were some proponents of naming the city “Hobarton” but the name didn’t stick. This state was named after Queen Victoria when it separated from New South Wales in 1851. Queen Victoria was a well-loved monarch, as evidenced by the fact that she has two Australian states named after her. Not only is the state of Victoria named after the queen, but Queen Victoria was able to name the capital city as well. She named it after William Lamb, the 2nd Viscount Melbourne, who was a close friend and adviser to Queen Victoria—not to mention the British Prime Minister from 1835-1841 (and a short period of time in 1834). Lord Melbourne believed in political rights for Roman Catholics, supported church reform, and avoided a war with France during his time as Prime Minister. Incidentally, Melbourne used to be named “Batmania,” named after Bruce Wayne… And by “Bruce Wayne,” I mean explorer John Batman. 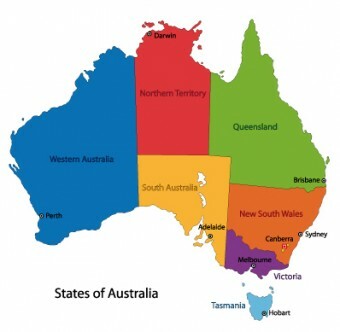 Western Australia—which is in the west of Australia (shock)—is the largest Australian state. It started being settled by free Europeans in 1826, and experienced a population surge in the 1890s when gold was discovered in the outback. How Were Australia’s States Named? How Did Sydney Get Its Name? Are Canberra AND Adelaide both capital? Nevermind. I got my error. Sorry about that.